The earliest variable speed drive applied in water plants in China was 1984, Shenzhen government constructed Second Water Plant in 1997 and constructed Third Water Plant in 2003. V shape filter chamber (valve, instrument, control board) material, water pump, medium voltage motor, computer system, analogue screen and projection equipments. Similar with other cities, Shenzhen water consumption is not even because of climate, human life and production. Flow changing affects throttle loss changing, especially in smooth area of urban. In the case of small lift, outlet pressure of delivery water pump changes obviously with flow changing. Pump station model was decided as per state of most adverse, most flow and lift. In fact, working in most flow only appears short time every day. In most time, pump station works in small flow. In order to adapt flow changing, many stations close outlet gate to control flow. So pressure different is wasted on gate resistance. When pump quantity is enough, they can adapt flow changing well. But pump model is limited. Too many pumps are not easy to manage, and also enlarge installation space, increasing project cost. Even though, this way can not adapt flow changing completely and still needs gate adjustment. Many water plants cut impreller of pump to adapt work point demand. Because work points are not consecutive, there is still energy loss. 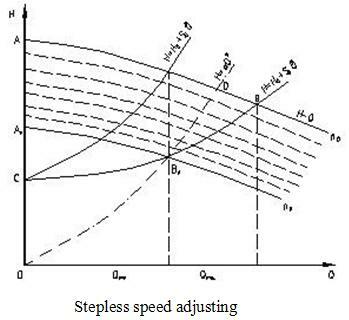 Thereby, technology of stepless speed adjustment can change pump speed consecutively to make flow and lift adapt pipe demand. This method can heighten efficiency and keep constant pressure for pipe, gaining energy saving. 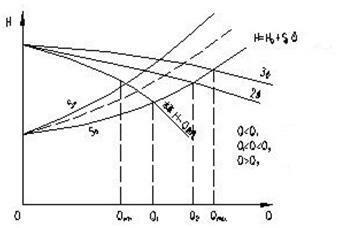 Look at the drawing: AB is character curve of constant speed pump. 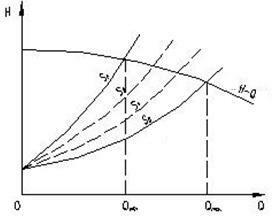 AnBn is character curve of variable speed pump. CBnB is character curve of pipe. Co is lift（including topographic height difference and free head）. When flow demand reduces to Qmin from Qmax, lift of constant speed pump rises along BA curve, lift of pipe lowers along Bbn curve. The difference value of vertical axis of the two curves is the waste. With variable speed technology, when flow demand changes from Qmax to Qmin, pump speed reduces to n1n2n3……nn from rated position n with flow changing. Q—H curve AB also changes into A1B1，A2B2，A3B3……AnBn correspondingly. Intersections BBn of these group parallel AB—AnBn and pipe curve CB are just in pipe curve. In this way, work point of pump can slip along pipe curve. There is no excessive pressure loss and pipe pressure can keep constant. Energy saving is considerable according to shaft power formula. In order to make system adjust speed automatically with flow changing. Main method is to install pressure meter at the most adverse position of pipe network and set pressure value. Pressure signal transferring to computer changes pump speed, reach constant pressure and balance of supply and demand. But the most adverse position is usually far from pump station, remote signal transfering is not convenient. 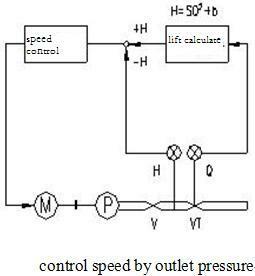 It is a common way that adopting outlet pressure and flow controls pump speed. Design institute and Shenzhen Water Group choose Gozuk variable speed drive with "one drive one" scheme. Two motors are mutual standby. Take example of 3# pump: circuit is composed of 3 vacuum contactors KM31, KM32, KM33, and 2 medium voltage isolators QS31, QS32. Contactors are used to switch between variable speed state and direct on line state. Medium voltage isolators usually close and only open for variable speed drive maintenance. a. Switch between direct on line state and variable speed state automatically. When variable speed drive is broken, system can switch into direct on line automatically. During stopping variable speed drive, no need to stop load. b. Implement "four work two standby" easily. Namely one works in variable speed state, three work in direct on line, two standby in direct on line; four work in direct on line, one standby in direct on line, one standby in variable speed state. Choose Gozuk variable speed drive with "one drive one" scheme. 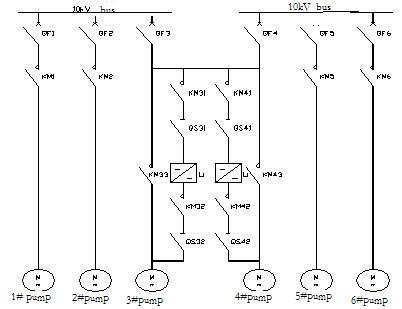 Take example of 1# pump: circuit is composed of 3 contactors KM11, KM12, KM13 and 2 medium voltage isolators QS11, QS12. 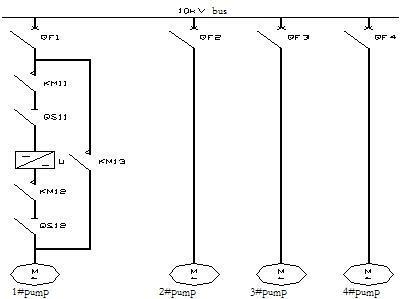 Contactors are used to switch between variable speed state and direct on line state. Medium voltage isolators usually close and only open for variable speed drive maintenance. b. Implement "three work one standby" easily. Namely one works in variable speed state, two work in direct on line, one standby in direct on line; three work in direct on line, one standby in variable speed state. Software of upper PC has friendly man-machine interface and supports Ethernet. It can remote monitor easily. It has functions of report and alarm, supports kinds of PLC communication. Because upper PC programme does support Ethernet communication protocol of Siemens, it needs OPC Server as transition. This way makes machine in local area network invoke parameter of this computer conveniently. That is advantageous to remote monitor. Two upper PCs monitor whole system together. When master PC A is broken and exits, slave PC B can monitor system to ensure safety and reliability. Control system is composed of main control PLC, bypass control PLC, variable speed drive and upper PC. Main control is Siemens S7-300PLC, bypass control is S7-200-PLC. Communication network adopts Profibus DP in bottom. Main control and upper PC adopt Ethernet communication. As control center of whole system, S7-300PLC copes with kinds of requirements from HMI. It monitors parameters of whole system, implements PID regulation for pipe pressure and keeps pipe pressure constant. S7-200PLC of auto bypass switches between variable speed state and direct on line state. Upper PC connects to PLC by ethernet. Take account of high requirement fof safety, reliability and stability, we use Profibus DP connecting for site control and Ethernet for monitor operation. Connect it to master server of local area network in coking plant, implement remote monitor. Siemens S7-200 equips with EM277 Profibus module; S7-300 uses 315-2 DP and equips with CP341-1T ethernet module. DP terminal is used to connect S7-200. Ethernet module CP343-1T is used to connect ethernet of upper PC. Economic effect of speed adjustment in Shenzhen Third Water Plant is obvious. Compared with original adjustment mode, 30% energy is saved. Furthermore, variable speed drive works stably and maintenance is convenient. It is controlled by computer, reaching optimizing control. We must continue efforts and try our best to construct Shenzhen Third Water Plant to an advanced water plant in the world.